I have had this book since M was tiny and I am surprised that I haven't reviewed it yet. This book follows a family of five ducklings who have grown up and nee to leave the nest for the first time. One by one the ducklings find the courage to jump out of the nest and into the pond to be with their mummy but will Little Quack be able to join them? As the story progresses you can count along with the tally at the bottom of the page to find out how many ducks are left. Until now I haven't really counted along but M loves counting things (in her own little language) so this has become a very important part f the story. As the ducks jump into the pond M has been copying them and trying to jump too, just like she does at her swimming lesson when they jump into the water. I love that when I started reading this book she just looked at the pictures and listen to the sound of my voice but now she is understanding the book and joining in. Children's development is amazing! 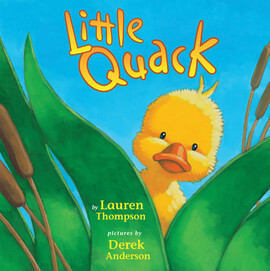 The illustrations throughout the book are incredibly bright and the ducklings very cute. The story helps with the concept of overcoming your fears as well as introducing maths with the "quack-u-lator" at the bottom for older children to learn basic adding.